Glengoyne Highland Single Malt Scotch Whisky has renewed its 12-month sponsorship of London Scottish for a third year. 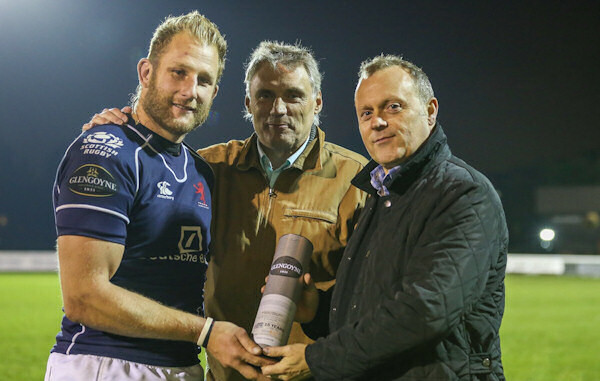 Mark Bright, London Scottish captain, was named man of the match and was presented with a personalised bottle of Glengoyne 15 Year Old. This new Glengoyne custom will be carried on throughout the season. A bottle of the 21 Year Old malt was also auctioned off to raise money for charity. Despite a last minute defeat to Nottingham Rugby on Friday, London Scottish currently sit fifth in the 2015-16 Championship league table. Neil Boyd, Commercial Director of Malts at Ian Macleod Distillers which owns Glengoyne, said: “Malt whisky and rugby go hand in hand and we’re delighted to be continuing our support of London Scottish for the third consecutive year. Mark Kemp Sponsorship Manager of London Scottish said: “Having an iconic Scottish brand like Glengoyne show their support for London Scottish is fantastic and we’re delighted they have chosen to renew their sponsorship for the third consecutive year. Picture caption: Mark Bright, London Scottish captain, was named man of the match and presented with a personalised bottle of Glengoyne 15 year Old by Neil Boyd, Commercial Director of Malts at Ian Macleod Distillers (right). Ron Wilson, former London Scottish captain and Scotland Rugby player, is also pictured (centre).